A compact battery switch that offers multiple installation options. Switches a single battery to a single load group. Blue Sea Systems m-Series battery switches are compact and waterproof and can be installed almost anywhere. The small footprint and three mounting options make installation easy. 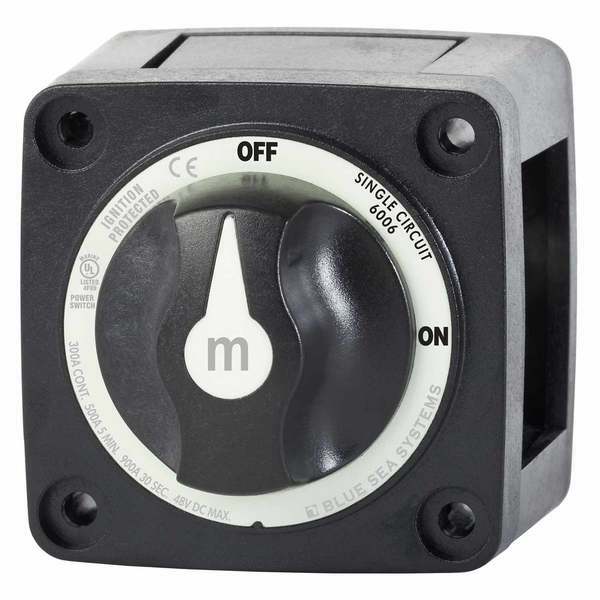 M-Series switches are ignition protected and can be located in the engine rooms of gasoline powered boats. The tactile texture of its face and removable knob makes operation in low light easier. Being removable, the knob adds a level of security and will prevent accidental power flow while servicing the electrical system. One piece tin-plated copper terminal studs are long enough to accept multiple cables and will accept the torque required to create a secure connection that minimizes resistance. For a small versatile battery switch that is easy to install and use, look no further than the m-Series from Blue Sea Systems. Waterproof; rated IP66, protected against dust and strong jets of water (for use on ship decks).